The concept of the “Inner Child”, also called the “Child Within” or “Wonder Child” is not a new one. It is present in ancient mythology and fairy tales where heroes are children who are threatened in some way; religions too have many stories about a child who becomes a saviour. What is our "Inner Child"? 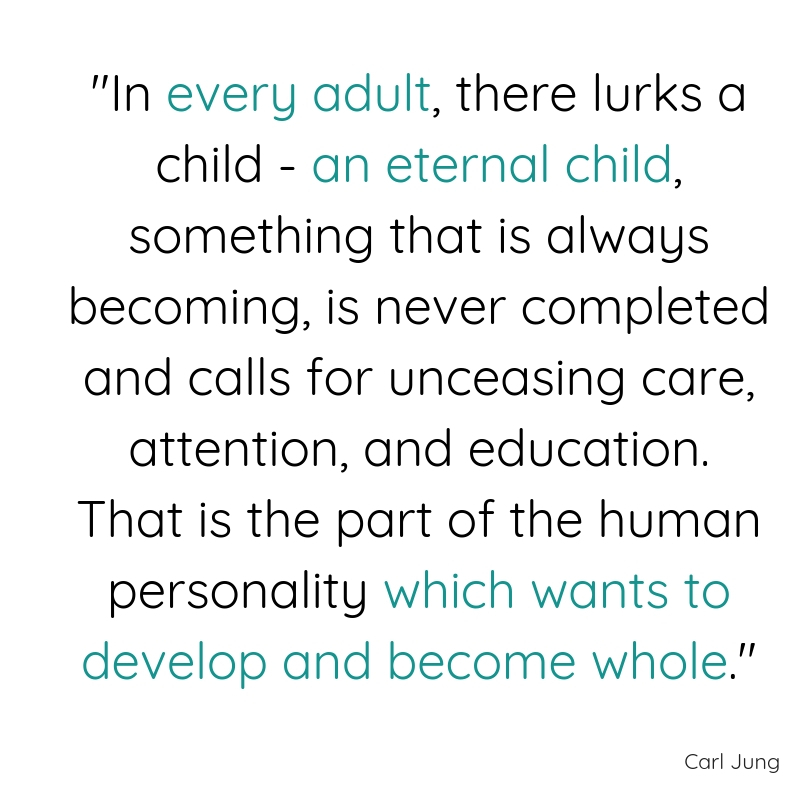 More recently in the 20th century, psychologist Carl Jung used the child as an archetype, a symbol existing universally and depicting one experience that all human beings have in common: we all start out in life as vulnerable and dependent infants. That vulnerable and sensitive part in ourselves remains at the core of our being. That is the Inner Child, our true self, the part that feels our emotions (sadness, anger, fear, joy) and that is playful, curious, spontaneous, creative and intuitive. It is not surprising then that, to some degree, we have all sent our vulnerable part into hiding in order to survive growing up, by equipping ourselves with a “protective layer” in the form of a “false self”, one that would protect us from harm and hurt, one that would get us accepted and loved. So we all have some Inner Child healing to be done. If our family of origin was troubled or dysfunctional, the wounds of childhood may be deep and still subconsciously informing how we live as adults and especially how we interact with others. What are the "wounds" of the "Inner Child"? The wounds of the Child are what we experience in our adult life as a painful feeling of emptiness, of being lost, like something is missing. So we seek that special something to fill our souls and we search for it outside of our selves through experiences, behaviours, people, places, things... We think these things will make us happy and whole. Unfortunately, sooner or later, we come to the harsh realisation that it does not work! Not long term! The only thing that will make us happy is within us and always has been; even if it had to go into hiding for a while, the Inner Child – as alive as it was then - is still there, at the core of our being. A new car, a new relationship, the perfect house may bring temporary relief (which we may well confuse for happiness) but eventually, the Child will start tugging again because we are not getting our emotional needs met in a meaningful way. Emotional and physical difficulties in adult life are a sign that the Inner Child is trying to speak. Discovering and experiencing our “Inner Child” in therapy is what can make us whole as the Child is allowed to come out of hiding, is acknowledged and is given a voice that is listened to. The Inner Child is our emotional self and it becomes a very valuable resource that helps us get in touch with our needs and begin the process of re-parenting ourselves in a loving, nurturing and healthy way. I find that working creatively with clients naturally invites their Inner Child to express its needs, wishes and feelings. The Inner Child cannot be reached with our thinking, analytical mind and the use of words often limits our emotional and intuitive expression. In my practice, I encourage my clients to discover their Inner Child through drawing, imagination, creative play with miniatures, shells, pebbles, visualisations, movement, creative writing in journals etc. I have seen many clients' lives transformed as their Inner Child becomes an alive part of themselves, as they make it their ally instead of their enemy. Inner Child work in counselling can become valuable support as you make connections with that part of you that wants to become whole and you become responsible for knowing and meeting your Inner Child's needs. It can assist you as you create a lasting foundation for a truly loving relationship with your Inner Child, the most important relationship there is, the only one you have forever.